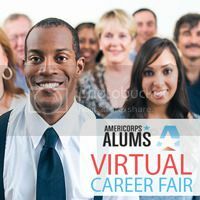 The AmeriCorps Alums Virtual Career Fairs connects public, private, and nonprofit employers interested in having AmeriCorps alumni on their teams with our highly skilled national service alumni pipeline. Learn more about the top five skills alumni bring to their careers in this infographic. We hosted two virtual fairs in 2016. All employers at the fair will have open jobs and recruiters available to talk one-on-one with alumni from the comfort of their home, office, smartphone, or tablet. Many of the employers participating in this event will be Employers of National Service (EONS). Aimed at creating recruitment, hiring, and advancement opportunities for national service alumni, EONS is a new initiative of AmeriCorps Alums, the Corporation for National and Community Service (CNCS), Peace Corps and the Service Year Exchange to support national service alumni careers. The AmeriCorps alumni at the fair will all come with experience tackling some of the nation's toughest challenges in education, economic opportunity, environmental stewardship, health, and support for veterans and military families through a period of intensive service in AmeriCorps. During the fair, employers and alumni will engage in one-on-one text-based conversations and have 10 minutes to network with one another. To learn more about registering for the fair and tips for having a successful event, browse our resources below. Still have questions about the fair? Contact us at careerfairs@americorpsalums.org.